As I sit here and write this post, it is a very chilly and very windy evening in central Illinois. Although wind is typical of March weather in these parts, I think that we can all say we have had enough. This Winter has affected all of us deeply. The harsh weather that we haven’t seen in many years came back with a vengeance and we definitely weren’t prepared mentally for it. I know I certainly wasn’t. Now that we are just a few days from the official start of Spring, we know that warmer temperatures are on the way. The light can definitely be seen at the end of the tunnel. I believe when we settle in for Winter it’s easy to go into sort of a mental hibernation or auto pilot, if you will. I think that this Winter put me into a weight loss hibernation as well, namely multiple plateaus that frustrated the crapola out of me. I would lose a pound, bounce back up one and a half pounds and then stay there for a couple of days to a week and then slowwwwwly return to the weight I had gotten down to. I’m not even sure how many times I have done this throughout the Winter. Very frustrating. I have had a hard time consistently keeping the number on the scales going down. I began working out in mid-December and I was constantly having to reinforce and remind myself that with working out that muscle weighs five times more than fat does. So I know that I was and am building muscle while I am shedding fat. It was still frustrating nonetheless. A constant thought in the back of my head has been, “Once the weather breaks and I become more active outside, it will be easier to jump start the weight loss. Just hang in for warmer weather.” That seems to be my mantra. I have been obsessed with the weather reports and watching the 10 day forecasts for a week that is consistently in the 50s and 60s. But it’s not just the weather. It’s been what I have been putting in my body as well. While I have continued to stay gluten free, I have occasionally wavered in my avoidance of sugar always with not so pleasant side effects. I have also taken advantage of the “GLUTEN FREE” processed foods (cookies, snacks, etc.) that have not helped either. I have found that for me I have to severely curb my intake of grains. And there is a correlation between how many vegetables I eat and my weight loss success. The more fresh vegetables, fruits and meat I eat, the better I do. If I don’t drink enough water throughout the day, it will also have an effect on my weight loss. Complacency has been a big problem with me this Winter. I have a tendency to justify what I eat that it will be OK (this time!) and then it quickly becomes a habit after only a few days. It is so easy to do. So I guess am writing this today as a testimony that during our journey, each and every one of us will have times of frustration and days that we will waver in our resolve to stick to our eating plans. But that does not mean that we have lost the fight. It only means we are human. 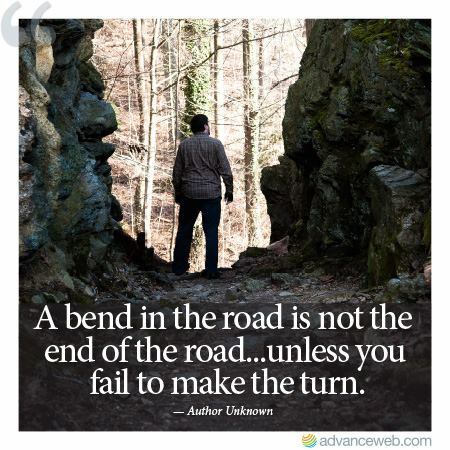 We all make mistakes and occasional bad choices, but it’s how we face them and go on that tells our story. If you or I have a bad day, it is just that. A bad day. Tomorrow is another chance to make better choices. Leave tomorrow in the past and concentrate on the future. I can do it. And I know that you can, too! The holiday has come and gone. I must say I did fairly well. No gluten ingested (that I know of) but I have to admit I did go a little overboard on my husband’s dark chocolate covered acai berries. Couldn’t stay out of the bag. Yum! But way too much sugar and I could definitely feel it the next day. I have been working out at least every other day as well. Enjoying working out for the first time in a long while. I continue to see changes in my body daily despite a weight loss slow down. I know it’s to be expected, but now that I am working out I realize I am toning up and that’s a very good thing right now. I need things firm up a bit. I ended my 21 day detox on Christmas Eve eve. It wasn’t too terrible, but I was glad it was over. I had really looked forward to eating some cheese and nuts other non gluten grains that I had to forgo for three weeks. I didn’t feel the burst of energy that I should have and that may be because I had a lot of nasty stuff to get out of my liver. I so looked forward to being able to eat some things on the ‘do not eat’ list when I was done with the detox. My first restaurant of choice to celebrate was Chipotle. Enjoyed it very much. Now I am looking forward to New Year’s Eve. No specific plans for going out. We will probably just stay home and watch The Walking Dead marathon on AMC. What are your plans??? How is being gluten free going to factor in to your celebration??? Or will you be more aware of gluten when you do go out if you haven’t started yet??? Whatever you decide to do, enjoy yourself and stay safe. PS. Once the holidays are over, some of my gluten free friends have promised to write a blurb about how they came to be GF, so watch out for that in the coming weeks. Eugena and Todd in the Bahamas 2000. Looking back on my childhood, I believe I always had a problem with gluten. For one thing I craved gluten along with sugar. It was nothing for me to come home from school and open up a 16 oz. Pepsi (or two) and devour a big bag of Doritos. At 5 or 6, I could eat adult sized meals – no problem. I slept a lot, but when I would wake up I wanted nothing to do with food. I have later learned that this is a symptom of adrenal fatigue (more on that in another post). I could go half the day without eating, but when I would start it would be continuous until I laid down for bed. My family did not try to teach me healthy eating. This is how I remember it anyway. Maybe they did. I only remember that I pretty much ate whatever I wanted. In high school, I stayed on an even keel with my weight at around 166. Fast forward to adulthood. I have gained and lost 1,000 pounds. I would get excited about some goal I had in mind (I am a very goal oriented kind of gal) to get me started. I would stick with a diet here and there, lose some weight but it would always come back, plus some. Many of you have done the same thing. Mostly, it was a diet that would deprive me of the things I really loved to eat and I would get to a point where I would hit the proverbial wall and I would swing back the other way. I think my life’s purpose on earth is to learn moderation, but that’s another blog post entirely! I could never do anything middle of the road. It was either all or nothing. I met my best friend and husband, Todd, in 1994. 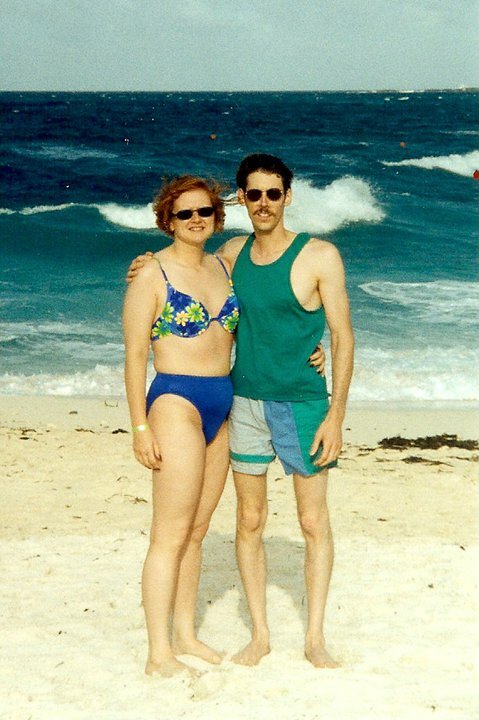 We were married in 1996 and I decided to lose weight in early 1999. My diet of choice was Atkins. I LOVED it! I could eat all the meat and cheese I wanted. I was in diet heaven. Along with working out, I dropped 75 pounds on Atkins in a little over a year. I even got down to my lowest weight ever as an adult. 142 pounds. 1 – 4 – 2. My main motivation this time was that we were going to attend a seminar in the Bahamas. I had fun picking out the first bikinis I ever owned to wear them on that trip. That fat girl was still inside though. She was waiting. Biding her time. My weight loss success couldn’t last. And it didn’t. You see, I wanted to be a Mom. A friend made a casual comment one day that I wouldn’t be able to get pregnant because I didn’t have any fat on my body (which wasn’t true), but that comment stayed with me. It hung around, subconsciously sabotaging my weight loss with great success. I wanted to be a Mom more than I wanted to be thin at the time. When I got pregnant with our oldest daughter who was born in 2002, I had gained back all of the weight I had worked so hard to lose plus added another 15 pounds to the total. And had two more daughters in 2005 and 2007. In January 2011, I entered a weight loss contest. $100 buy-in. 6 of us entered. It ran for 3 months. I chose to follow Dr. Eric Berg’s “7 Principles of Fat Burning”. The first thing is you go on a three week liver detox plan. This plan eliminated grains, refined sugar and limited cheese. No soda or caffeine. It was at the end of this three week period that I had an Aha! moment. I realized that my migraines had lessened in frequency and muscle pain and flare-ups had done the same. It felt better than I had in a long while. Brain fog was lifting and I had a lot more patience with my kids and it seemed that my mood swings weren’t as bad. Could it be the elimination of wheat and grains (and sugar) from my diet??? I started doing a lot of research on the gluten free (read “Wheat Belly” by Dr. William Davis) and decided to use info in Wheat Belly and Dr. Berg’s plan and the pounds were coming off consistently and I was gonna win that contest, darnit! Well, I did win. I lost the most body fat percentage which which equaled 34 pounds. I had every intention of sticking with it, really I did. But then my Dad passed away. Life overwhelmed me and I slid right back into my old habits, slowly at first. It was easy enough to do because the weight didn’t come back fast. I was able to maintain my weight loss for a year before it came back in the last year or so. The symptoms I had experienced before came back with a vengeance. Some of them worse than before. And I realized I needed to do something. This whole decision making process took a year for me to commit to it, though. I was tired of being sick and tired all the time. I didn’t want to hit my next milestone birthday (in less than two years now) feeling and looking like this. I spent a lot of time thinking about my kids. What was I showing them by not taking care of myself? I was flat out not being a good role model for my girls. Would I make it to holding my grandbabies and watching them grow up if I kept doing the same old thing and repeating the same old patterns? I don’t think so. I knew I couldn’t go on like this. I had to change for ME, first and for the people I love and want to be with for as long as possible, second. Maybe I can live to 100 or beyond??? 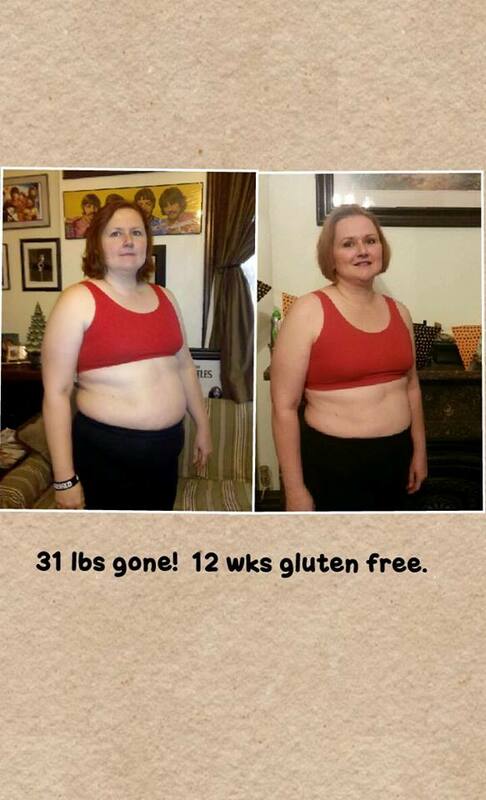 I knew gluten free worked for me and I believed it would work again. So I started gluten free for the second time toward the end of August. This time I eliminated sugar, too. And high fructose corn syrup and trans fats and caffeine and trying to eliminate processed foods as well. Some would ask, “Well, is there anything you can eat?” And my answer is A LOT!!! 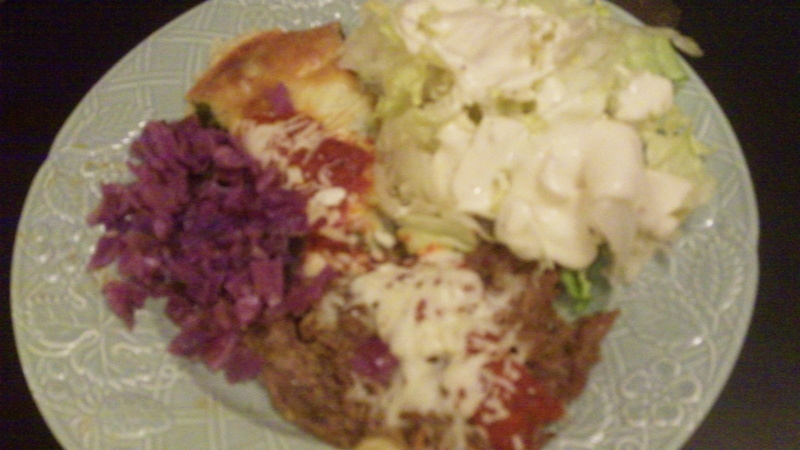 There are things I am eating now that I never thought I would eat and it’s good and tasty and I am enjoying finding new recipes to try. But I am open to trying new things. That is the key to it, I think. You have to be willing and open to try new things. Eliminate the junk (because it is slowing killing you!) from your diet and you can have success as well. I am always here to answer questions. I am taking you step by step through my process. And believe me, if I can do it, anyone can. You have to make the commitment to yourself and take one step at a time and move forward. It won’t always be easy, but it will be so worth it in the long run. I had quite a few people ask for the recipe so I am putting on here for y’all. 3. When water is boiling transfer rinsed quinoa to water and return to boil. 4. Cover: reduce heat to low and continue to cook until the water is gone and quinoa is cooked, about 12-15 minutes. 2 large leaves of kale, set aside. 7. When quinoa is done, transfer to a mixing bowl and mix with chopped kale. Allow to cool to room temperature. 10. 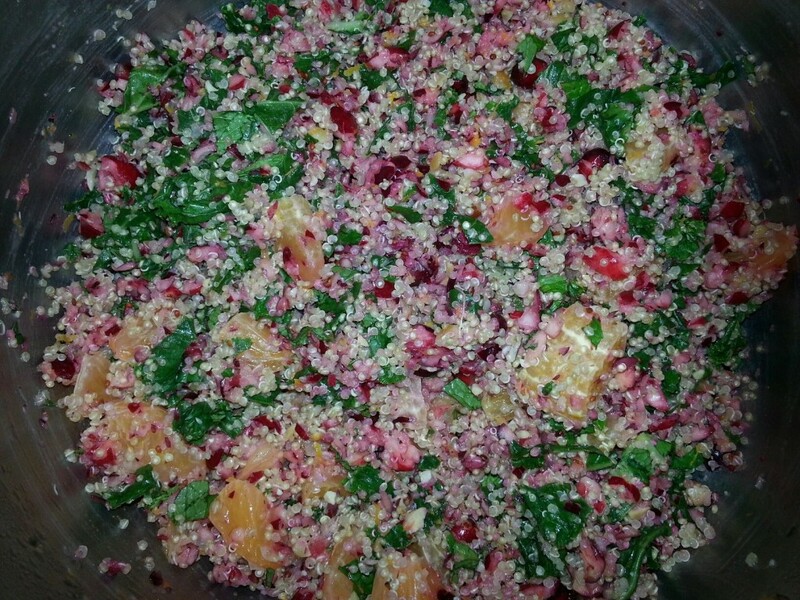 When quinoa is completely cooled, gently stir in the oranges and cranberry mixture. 12. cover and refrigerate until ready to serve. It was was a hit at my in-laws house for Thanksgiving. Nice flavors and went nicely with turkey. Would be good with a roasted chicken as well. Honesty. Sometimes that is a really hard thing. I said I would be open and honest about my experiences on this road to health and wellness. It’s very difficult to come to terms with how I perceive myself and how I really am. Not that it would make much sense ordinarily but just looking at the pics I am posting brings it to a head for me. Over the last 12 weeks (this sounds better to me than three months), I have watched my progress in the mirror. I know that I am thinner than I was 12 weeks ago. The scale tells me so. My clothes fit better and I have even given some away that no longer fit, which is a great feeling. Nonetheless, I was definitely disappointed when I took the progress pics and then compared them to the beginning pics. I didn’t see as much progress as I felt I had made during this time. I am not posting this to get the rah-rah “cheer me ups” from you. I am just saying it like it is for me. I know I have made great strides, don’t get me wrong. It’s just how I perceive myself versus the reality of the situation. I am not discouraged in that I will abandon my goal, far from it. This makes me all the more determined to succeed. A friend said to me today that what I have lost is equivalent to carrying around 4 gallons of water. Just try to carry around 4 gallons of water for any length of time. It ain’t easy. My energy level is much higher. The brain fog is lifting and my patience is much better these last few weeks. I haven’t had a migraine in over two months and the usual muscle flare-ups have not shown up in almost as long. I would say this is the REAL progress. I know that I shouldn’t gauge my progress by pictures alone when I think about all of the other positives that have come about in 12 weeks. Pictures are only one element of the whole experience. But those pictures bring up a realization. I MUST start exercising!!! This is very hard for me. I have never been athletic or one who enjoys getting exercise. Not in my DNA. My family never encouraged or participated in exercise or athletics of any kind. I have to find the right fit for me. I need to find the type of exercise that I can enjoy because if it’s not fun, I ain’t gonna do it. I have exercised before (really, I have!) and I know that I do feel better when I get some exercise, but I am having trouble figuring out what I want to do. The weather is steadily getting colder and I do like to walk, but I don’t like to be cold when I walk. I know, making excuses here, but I’m all about the honesty so I am honestly saying I haven’t found anything so far I do like to do. That’s a lie. I do like the Wii Fit Plus. I have done that in the past. May try that again. Thinking about the C25K app and start running, but not sure about it. I have never liked running so I don’t know why I would suddenly like it now. Maybe I should wait another 30 pounds down and then try it. Maybe thinking interval training might work. I will have to check into that. They have Zumba in town two days a week now. Been thinking that over, but their space is small and I have heard they have been packing them in the room. Not really my idea of having a good time being packed like sardines into a room and being told to move and sweat and have people see me be totally uncoordinated. Did I mention that I’m uncoordinated? Dance would have been a really good idea for me when I was younger, but the folks had other priorities ie. bills to pay. So there you have it. Not happy with the pics, but not going to let it discourage me. Another notch in the motivation tool belt is all it is. I ran into a friend of mine at the store last night. She said I was looking great and I was carrying myself differently. I had to think on that a bit. I guess so. I am gaining confidence. Each step I take is another step toward my goals. Another friend said to me that if by seeing these pics and following my journey that I can help one person along the way take that first step so they can achieve their goals, encourage them along the way and make them feel they are not alone then it will all be worth it. How very true. I know that I cannot do this alone. I have an awesome support system of people who love me unconditionally and encourage me on a daily basis to be a better person in all ways. Thank you, minions. You know who you are! My journey is your journey. We will walk together and be healthier & happier as a result. Take one step toward your goal today. It takes only one step to begin the journey.